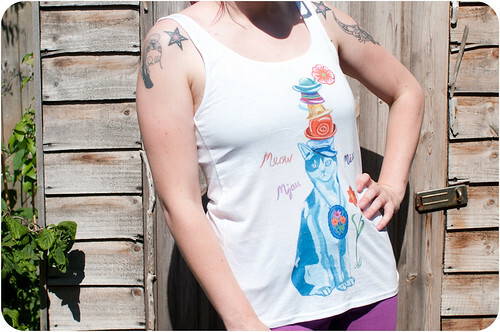 It’s so sweltering hot today that I nearly didn’t take photos of my new cat top as I feel like I’m going to melt! At least the top is perfect for this weather. I got it from H&M in the sale and it was £5. I love that the name of the artist is on the label, so often tops like this have no credit to the artist so it’s nice to see who created the design. You can see her portfolio here. Due to the heat I’ve clipped my fringe back with one of my Doodlecat hairclips to keep it off my face. I had forgotten what I look like without the fringe. 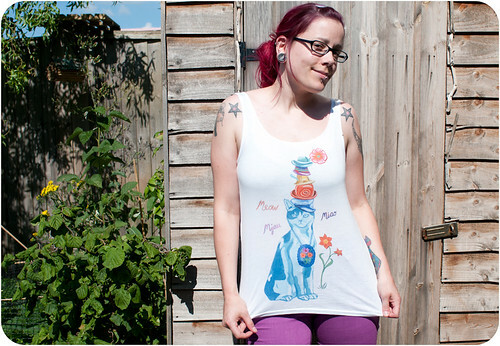 Pixie thinks it’s hot too. She’s mostly staying in the shade apart from when some meanie wants her to be in a photo.